"Rotten to the Core" is the twenty-seventh comic issue, which was released 4 October, 2006 in the US. The weather on Earth is not acting normal, and it is soon discovered that it is Professor Farnsworth's fault...and some of it being Bender's. Bender sold an inner-Earth vehicle of Farnsworth's to an alien race called the Magmoids, who have used it to drill to Earth's core and steal it's magma. Farnsworth calculates that it will soon cause Earth to explode. He sends Fry, Bender, and Leela into the core using a copy of his craft. While Fry and Leela are asleep, Bender stops the craft and steals hundreds of diamonds from a secret layer well under the surface. Leela takes Benders diamonds (however, he later stuffs them in his chest). As they get closer to the magnetic center of Earth (as well as the core), Bender's inhibition unit malfunctions, so Fry has to strap him to the wall so he doesn't get hurt. They suddenly break through, into the core, where they find the Magmoids. However, the aliens imprison Fry and Leela as they steal the last part of the core. Bender, still malfunctioning, breaks free of the straps and goes out of the ship. His chest opens, blinding the Magmoids with the light shining off the diamonds. 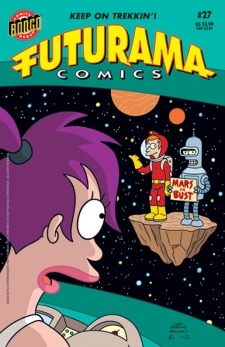 Fry and Leela break free, use gamma prods to melt the Magmoids, therefore replenishing the core, before escaping knowing they saved Earth. Later, Professor Farnsworth is fined for putting Earth in danger. He uses Bender's diamonds to pay off his fine. Ashton Kutcher is on the $15 bill that is seen buried deep underground, below large skletons and a head jar containing someone whose name starts "Ji". Glab's office at DOOP headquaters, apparently in New New York, has a large portrait of herself with Nixon and Zapp. Bender makes rare use of the word "Sorry". The comics seem to have reverted to the standard head jars. The title and plot of this issue reference The Core and similar older films such as At the Earth's Core and Journey to the Center of the Earth. Calculon, Monique, Linda and Nixon's head are seen in New New York's wind storm, but none of them are from the area, H.G. Blob is also seen in the wind, but he is a fairly regular visiter to the city. Tinny Tim and Fender, on the other hand, are residents. The New New York DOOP headquarters seen in the comic look like a repaired version of the Weehauken, New Jersey HQ. It is possible however that the DOOP simply reused the design.